At least I rolled up. This weekend the Bay Area Sea Kayakers were paddling in Mendocino, and I had the fortune to paddle with them and run the fabled "Disney" slot. Jeff has me practicing a protective tuck position on my landings to keep my paddling injury free. Unfortunately I haven't quite got the balance of it yet and am capsizing on many of my landings. The upside of this is lots of eskimo roll practice. Thanks for the video Peter and a special thanks to Jeff for all of his coaching and patience. Sooner or later . . . it was going to happen. BASH! Brindle's Bash is one of our favorite rock gardening features on the Mendocino Coast. 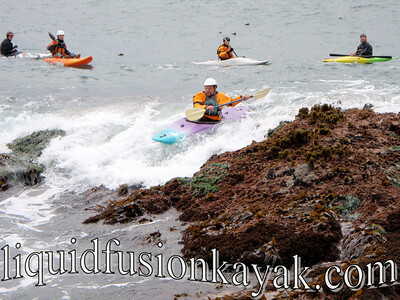 As our typical NW swell wraps around the north point of Noyo Bay it hugs the shoreline and creates a very fun whitewater ride over a bedrock outcropping along the north side of the bay. 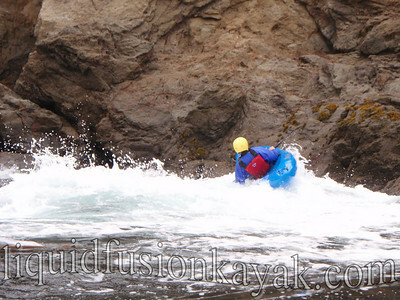 On some tides and swells, the wave and whitewater ends with a spectacular bash on the rocky cliff. The Bash is very spectacular - representing an explosion of whitewater hitting the rock and shooting away from the rock. "Waaaabooof and splash" is the sound that it makes (I must get some video to help with my description). Dramatic effect is very evident in this feature. This year we have run it hundreds of times in both our whitewater and sea kayaks as well as coached our students in running it. On a high tide, Jeff has been riding the swell clear up above the bash and then sliding down with the spray of bash behind him. In skateboarding terms, it is kind of like doing a kick turn on the top of a half pipe. My strategy has been to ride the feature with a low brace turn away from the bash letting the spray from the bash rain on me. 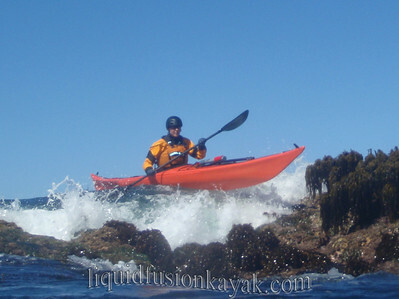 Lately I have been taking bigger and bigger and bigger rides the ones that inevitably sweep the paddler into the bash. Now the story of my bash . . . It was a warm, sunny day on the Mendocino Coast - too perfect of a day not to be on the water. My friend Kim was visiting from San Diego and we were playing and exploring in the Noyo Bay and around the Fort Bragg Coastline. I had just finished explaining Brindle's Bash and saw a nice swell on the horizon. I quickly excused myself and paddled around to get into position. It was a good size wave but no bigger than many that I have taken. 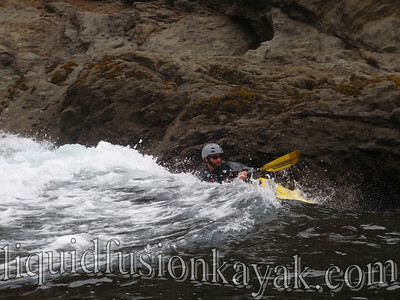 I took a couple of forward strokes as the wave built behind me and was instantly elevated about 6 feet and swept over the rock in a rush of whitewater. I don't know if the swell was bigger than I had anticipated or just what happened but I was being hurled directly at the bash with none of my usual low brace exit maneuvering. Bashing was inevitable so I purposely capsized my kayak so that the bottom of the boat and not me would take the bashing. The pillow of water in the bash prevented collision with boat and rock; although, Kim reports that there was quite the dramatic "Waaabooof" sound of water hitting the rocks. I of course did not hear this as I was underwater in the swirling whitewater timing my roll. Sorry to report for those who were hoping to hear of more significant carnage - I made my roll and my little mermaid boat and I were just fine but with a story to tell. Wheeeeeew! Kim tells me that it definitely had entertainment value. Too bad she didn't have the camera.